Historical analogies may be inaccurate, but Americans may need to look at their own civil war and compare it to what is happening in Ukraine now. Today the US supports a murderous criminal adventure that has little to do with unifying the country. This assessment came from Professor Stephen Cohen, prominent US scholar of Russian studies and author, who advised George H.W. Bush in the late 1980s. He spoke to RT about the mistakes of the consecutive American administrations in their Russia policies, the worst crisis in decades that they led to and the deterioration of political discourse in America that prevents things from changing in Washington. 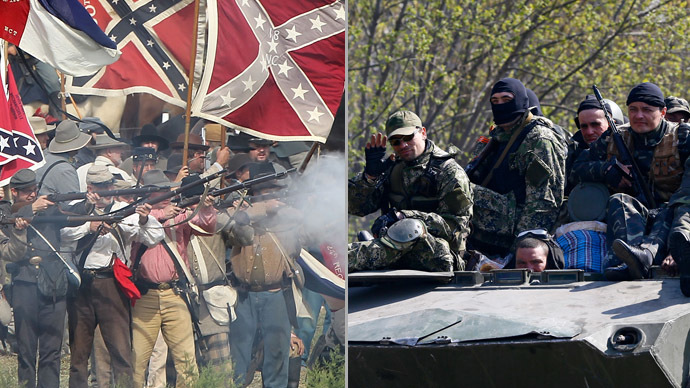 “Lincoln never called the Confederacy terrorists,” the scholar pointed out. “He always [called them], no matter how bad the civil war was, fellow citizens he wanted to come back to the union. Why is Kiev calling its own citizens terrorists? They are rebels. They are protesters. They have a political agenda. Why isn’t Kiev sending a delegation there to negotiate with them? What the US doing with Ukraine now is alienating arguably the best potential ally it has now, Cohen said. Russia helped the Obama administration save its face in Syria, where the president was pushed into bombing the country over chemical weapons. It helped make bridges with the new leadership of Iran to start the first serious negotiations in decades. Cohen blames the US, particularly the Clinton administration for setting the world on a path that led it to the current confrontation between the West and Russia. This lack of ability to change policies is evident in the current administration, the scholar believes. One anecdotal example Cohen cited is Obama’s refusal to talk to former Secretary of State Henry Kissinger. It’s no surprise that a leader, who doesn’t take into account various viewpoint on a problem cannot take a rational decision on tackling it, Cohen said. Unfortunately for America, it’s not only the White house that discourages debate now, but also American society in general, the professor said. This situation is a sharp contrast to what happens in some other democracies, which don’t hush a public debate on foreign policy issues and don’t try to push opinions not liked by the political establishment into the ‘fringe press’.